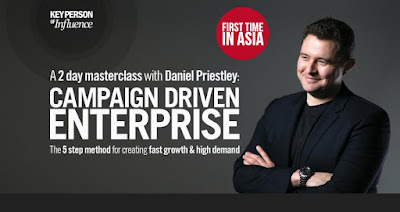 In the past few week’s, the guys over at Key Person of Influence Singapore (KPI) have been working to get Daniel Priestley to run one of his acclaimed masterclasses here in Singapore. Daniel Priestley is a renown entrepreneur, sought-after speaker and author of the three best-selling books including Become a Key Person of Influence. Most businesses are designed to win new clients one at a time. This is a really slow and shaky way to grow a business. Campaign Driven Enterprises however create killer promotions that allow them to bring on a LOT of new clients, all at once. Successful companies often start with great campaigns. Nike, Apple, even Virgin started (and continue to thrive) using campaigns. It’s how Daniel started a successful business when he was only 22, creating an immediate impact to his industry. This is the perfect workshop for helping you drive growth in your business - I've personally been through other KPI workshops and can attest to the quality of their content! I'm learning and trying to apply many things that I've learnt from them into practice. This event will be limited in seats, so it's interactive and hands-on. The price for this event is $1,247, but as I am an event partner, I managed to get an early-bird offer of only $897 for my readers! This is only if you secure your seat by the 30th June 2015 (save 28% and guarantee your seat, as this masterclass is most likely to sell out). For more information and to secure your seats, click here. By the way, I will be attending this masterclass too so I hope to see you there!